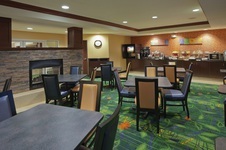 The Fairfield Inn and Suites by Marriott Portland West/Beaverton is conveniently located eight miles west of downtown Portland & 50 miles from the Oregon Coast. The hotel is the perfect place to work or relax. Enjoy an evening in a comfortable Studio Suite, a splash in the indoor pool & over 15 delicious selections available on the Continental Breakfast buffet. Nike World Headquarters is located only 2.5 miles away, while Intel has its campuses about 4.5 miles away. We are located just minutes from tax-free shopping at Washington Square Mall and The Streets of Tanasbourne, Century Theaters, Tualatin Hills Park & Recreation, championship golf courses such as Pumpkin Ridge and The Reserve, and wine country featuring globally recognized and award winning Pinot Noir.